Many readers will by now have seen the Bloomberg story trumpeting the demise of the CNY short...or at least what looks to be quite a lot of expensive options expiring worthless. On a seemingly daily basis, meanwhile, we are treated to commentary suggesting that a stable to lower USD/RMB implies that the Chinese authorities are holding firm by preventing a further depreciation. At the risk of repeating himself, Macro Man has to tip his cap to the Chinese authorities for an absolutely superb sales job...certainly a better one than those conducted by certain poorly performing fund managers who pimped their CNY views on TV. For not only has the RMB not been gaining ground over the past couple of months...it's actively been depreciating against the policy basket that the Chinese now seem to care about. Keyser Soze would be proud. Needless to say, the street has been long the chart on top rather than short the chart on the bottom. That, my friends, is how articles like the one linked above get written. Or is it? 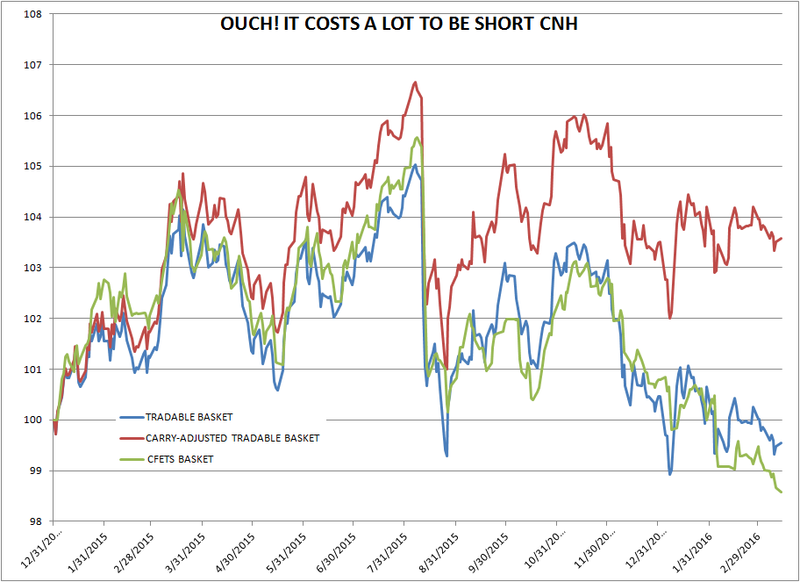 What's the true cost of being short the RMB against its 13-constituent basket? Macro Man decided to investigate. Ah, but what about the carry? 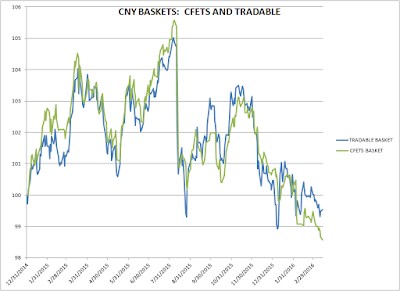 While it's true that the CFETS basket contains ultra-yielders like the RUB, it's equally the case that there is a hell of a lot more weight given to low-yielders (USD, EUR, JPY, and HKD account for nearly 70% of the basket.) 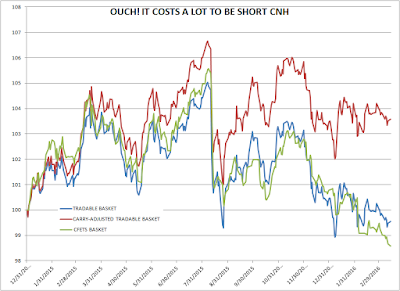 If you want to be short CNH and long all of that stuff, it's going to cost you. How much depends on what part of the curve you choose to fund at; Macro Man used 3 month forwards and calculated the implied daily carry from them. The picture above looks rather different when you include the cost of holding the position. Obviously, on an individual trade level the picture can look a bit different, particularly if you're astute at locking in attractive funding levels. By the same token, it could also look a lot worse- recall that three month implied CNH rates were over 10% in January, and overnight rates hit 65%! 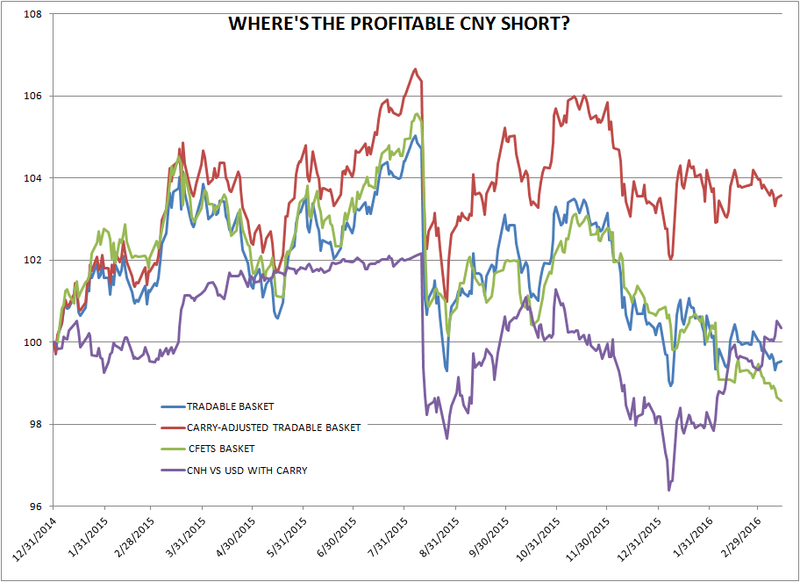 Nevertheless, it should be clear that the true profitability of a CNY or CNY position can be a lot different from what you see on a spot or index chart. That's particularly the case when you consider that none of the charts above include transactions costs; please rest assured that they are pretty clearly not zero in real life. 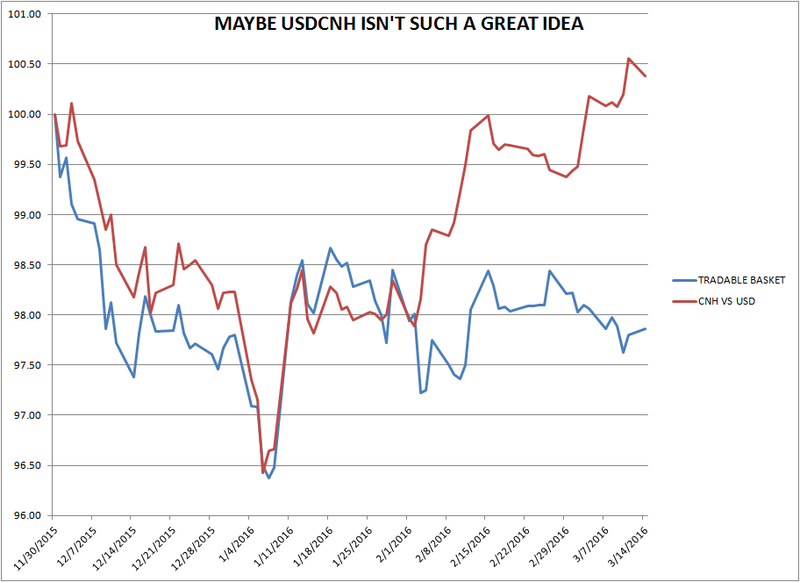 At the end of the day, perhaps that's why punters keep returning to the simplicity of USD/CNH or USD/CNY. While those trades were profitable during the volatility of August and January, they actually look pretty poor as a buy-and-hold proposition. Believe it or not, on this calculation holding long USD/CNH since the beginning of 2015 is now a loser. The moral of the story is that the RMB trade is not a sell-and-hold proposition, regardless of what the purveyors of fanciful wishcasts might tell you. If there were ever a market that called out for hit-and-run, tactical macro, this is it. There's money to be made in the China trade..but when you see it, ignore the stars in your eyes and take some off the table. Because the Chinese appear to be having their cake and eating it too. 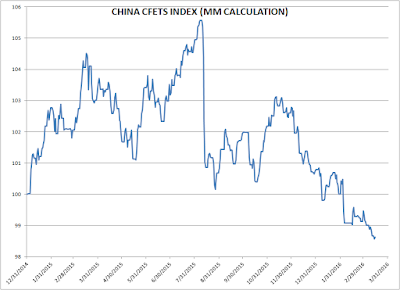 The stability in USD/RMB has got the West off their backs (for the time being.) 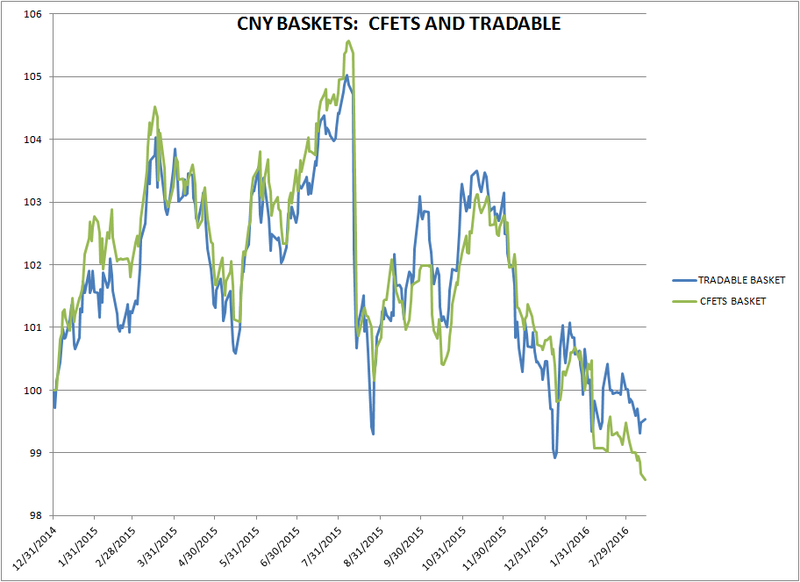 The depreciating RMB versus the basket is achieving their actual policy goal. And the prohibitive cost of being short RMB means that even with the depreciation, most Western specs cannot make money! Forget Keyser Soze; the Chinese are pulling the greatest trick of dissimulation you've ever seen. Does that mean the exporting deflation story is still on? I guarantee they are. They tell you so on the cfets website. Monday sell side commentary: lowest USDCNY fix of the year. True. Also Monday? Lowest basket fix of the year. What about just hedging out proportional eurusd and usdjpy as a strategy? MM, it is only easy for them when the USD is in corrective mode. I think it will be a war of attrition. They win a few battles here and there but may lose the war. Profiting from Yuan devaluation as you mention will not be easy either due to carry. I think they have made some major strategic errors such as blinking last August and more recently making references to fighting speculators. In a strategic way to me, this implies that there is a good chance they have lost. The CB saying they are fighting speculators is like saying the peg is safe. They would not need to say it is safe if it was and they would not need to say they are fighting speculators if it wasn't a real threat. No comment would have been the best option there. By just saying that they are fighting speculators is a signal to other speculators that the situation is fragile and when there is weakness again, speculators will be all over it again and the spike in USD.CNH will probably be more than in January. I know. You know I know. I know you know I know. We know Henry knows, and Henry knows we know it. We’re a knowledgeable family. "For example, of the 30 components of the Dow Jones Industrial Average, 20 reported “adjusted” earnings, with 18 of them reporting adjusted earnings that were higher than their earnings under GAAP, according to FactSet. That 18-to-2 relationship alone shows the clear bias of these adjustments: They’re used to inflate earnings, not to lower them to some more realistic level. These adjusted EPS were on average 31% higher in 2015 than EPS under GAAP. That’s way up from 2014 when 19 of the Dow components reported adjusted earnings that were on average 12% higher than under GAAP. And yet, despite the soaring portion of fiction, these adjusted EPS of the companies in the DOW still declined 4.8%. That’s bad enough. But under GAAP, beautified as it might have been, EPS plunged 12.3%." I think that Beijing's strategy is to move (devaluing) suddenly to overshoot when most speculators look away and when those speculators chase the train, they can shoot back and burn those traders with the carry cost. Some of those traders will make a profit, but a large number probably would lose money along the way. If they can scare off some speculators and control the devaluing (inevitable) process, they would be consider it a success. @MM "The greatest trick the Devil ever pulled was convincing the world he didn't exist." For the last time guys, China is not a market - the PBoC governor said 'capital controls' are working much better now, which I take to mean the Ministry of obedience is actively, um, interrogating currency shorters, money xfer agents and the like. everyone joining the hammock with LB or what? everyone joining the hammock with LB or what?" Always lurking ... count on it! Not sure what to think about the current environment really. March has so far been great for risk assets, but can it last? I am not so sure. Following on the topic of MM's excellent post today, I am surprised by how quick the market has decided that -ve rates are no longer a problem. Because you know, apparently Mr. Draghi defused the currency wars last week with his focus on "domestic credit easing" rather than the euro... in the same vein, the PBOC is apparently not in the spotlight on its currency anymore etc. I am not sure I believe any of these stories, mind. One thing which is clear, though, is that EM/energy/commodity shorts have had a scare, a big one! Short covering here could conceivably add more juice in the short run. "On the non-Durable side of the data it is worth noting the remarkable buildup of pharmaceutical inventories this cycle. We assume this is more a function of higher drug prices rather than a surge in the number of tablets held in storage but at $53.58 bln this is now the largest single contributor to Wholesale Inventories with its share at a record 12.4%, up from 9.2% in December 2013 and we do not view this surge as a bullish phenomenon. Petroleum has seen its share of Inventories fall from 15.8% to 7.5% over the same period, a reminder of the fact that a relatively small move in the statistical total hides remarkable shifts in sector performance over the last two years . " I guess we get to know if the 200day holds or not tomorrow. Small caps/oil related risk have already come off a few percent but nothing major and Fed can easily top them all. Should be an interesting afternoon tom. A surge in pharma inventories seems very bizarre, right? ?